I created The Urban Guide for Alternate Use as an online guide to urban design hacks and examples of individual design resourcefulness in the city. It is both a catalogue and catalyst for creative reuse of urban objects and areas – ways in which people are treating the city not as the end of a creative process, but the beginning of their own. 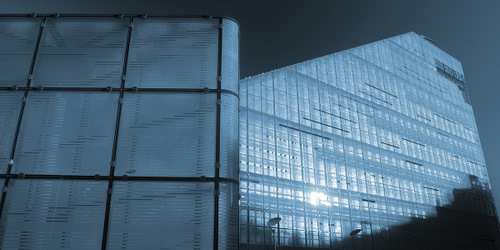 In the Urban Guide for Alternate Use, the city is source material, and the urban infrastructure a maleable environment. The Guide was launched in October 2010 as part of the Exchange Radical Moments festival and is sponsored by the EU Education and Culture Programme. Map of Bairro Criativo projects throughout downtown Porto. The Porto creative agency ADDICT, lead by Michael DaCosta Babb, asked me to create and direct a project exploring the question “how creative can Portugal be?”. The result was Bairro Criativo (Creative Quarter). The project was the latest in my City As Platform projects, where the design of the city isn’t the end result of the creative process, but the city itself becomes a platform for open creative development by the public. I put out the call through ADDICT’s communication channels to invite anyone in the city – designers, homemakers, business people, kids with crayons – anyone – to think of one thing they’d like to do to temporarily improve people’s daily lives in Porto. The only criteria was that the proposed ideas had to be simple, quick, and go in and come out with only a light touch on the city – nothing destroyed before they are installed, and no damage when they leave. 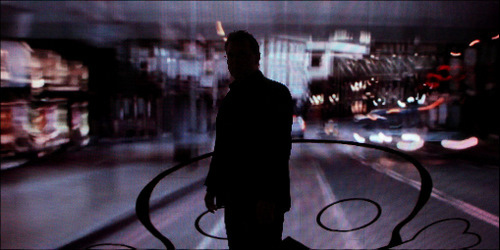 A still from one of the videos produced for the series, exploring design, the city and inspiration. Nissan Design Europe brought me on board as Creative Director for the London leg of their Nissan Cube launch activity to explore design, the city, and inspiration. Thus was born the Designing Inspiration series. Designing Inspiration included a series of video profiles of key London creatives exploring London and detailing the places that have inspired them over the years; an event series where designers, artists, comedians, architects were asked to invite those who inspired them to speak on the night, creating a sort of tag-team event series. I created the strategy and developed the concept for the 2009 edition of the Montreal Biennale: Open Culture. Open Culture was structured to bring an open source creative approach to the tired format of biennials. In this case, the artist was not the sole and final author of the work, but merely the catalyst for the public to then take over and produce the final work. 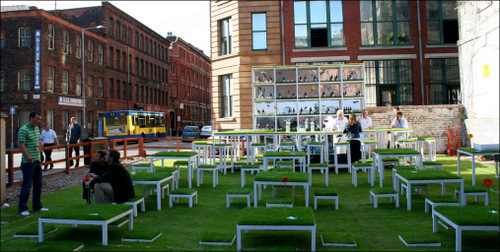 From 2003-2006 I was Creative Director for Urbis, Centre for Urban Culture in Manchester, UK. Launched in 2002 as a static visitor attraction devoted to the spectacle of the city, I was brought in to create new strategies for the way forward and offer some creative direction that would revitalise the institution. There are many measures of the success I brought about at Urbis, but one of my favourites comes from the The Guardian newspaper. A month prior to my arrival they wrote that the failing Urbis “might one day make a nice block of flats.” Two years after my arrival they wrote that I had transformed the insitution into “an intellectual powerhouse that explores modern urban environments with creative flair.” Below are some of the projects I did at Urbis that brought us to that point. 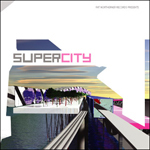 I created and directed SuperCity in 2005 with famed British Architect Will Alsop to completely re-think the future of the city, using a linear stretch of former industrial cities across the north of England as starting points for what the future could be. We explored vertical farming, linear megacities, new modes of transportation, industrial production, and a variety of other topics inspired by applying the simple motivator “what if…” to many of the problems facing cities today. It was a massive undertaking, involving everything from super-sized architectural models and videos exploring future scenarios to video games created for children so they could shape future cities according to their own desires. Along transportation routes in the north of England posters were installed, each detailing a different scenario of future life in the city if we changed things, and public talks and workshops were held to generate a wide range of discourse amongst the public. One of the most inspiring and unexpected outcomes of the project is that the concept began inspiring others, and suddenly parallel projects began appearing working with the project’s concepts. 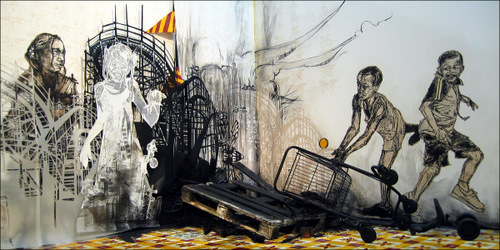 Exhibitions were held in other galleries showcasing work by artists who lived “in the SuperCity”, and a personal favorite is that a compilation album was released named after the project. Urban Oasis was created by the Office for Subversive Architecture (OSA) as part of a wider portfolio of urban intervention projects I was directing. I was getting frustrated with so many urban areas in need of improvement, but cities unable to do anything because of the cost of regenerating areas. This was the beginning of many “urban acupuncture” projects, in which transformations could be quick, cheap, and instantly rewarding for the people who use the space. OSA was an early proponent of this approach, championed later by Rebar and many others. It’s been a pleasure to work with them all. The artists we invited have now become legendary names in the scene: Swoon from New York, Os Gemeos from Sao Paulo, Dave Kinsey from Los Angeles, Kami and Sasu from Tokyo, Fakso from Milan, Loomit from Munich, Dave Ellis from New York, Marok from Berlin, and Influenza from Rotterdam. The work they created remains among some of the best I’ve ever seen. And yes, I’m partial, but even Wooster Collective referred to the show as one of the ‘seminal’ street art shows ever done. Oh yeah – the ‘getting in trouble’ part… after a wild launch party, I was woken up by a call from my assistant who told me that there were calls for my resignation on the BBC and articles appearing on the BBC website attacking the show as well. What followed was 36 hours of intense media attention – dozens of interviews, TV appearances, and general insanity. But the lesson always remains the same – if you want something to become hugely popular, try to close it down. Nothing makes people want to see it more. The opening day of the show had a decent turnout. After the media storm, there were queues waiting to get in. I was very pleased to bring The Peter Saville Show to Urbis in 2004, offering a full retrospective of his work for the first time in his home city of Manchester. But as always, I wanted to also do something big and bold in the city. So Peter Saville and I created the At Home project to turn the streets of Manchester into a gallery space. 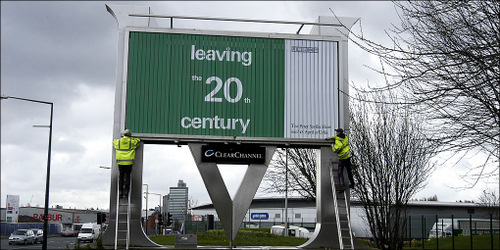 Across the city Saville curated a series of billboards with designs, phrases and ephemera that had inspired him early in his career, ultimately returning the visual inspirations back to the city. In 2002, the city of Barcelona hosted the International AIDS Conference and wanted a project that would communicate the impact of AIDS on the city in a more unusual way than the usual poster campaign, so they asked me for some ideas. Each memory was placed on a plaque, and overnight on the eve of the conference, each plaque which described a memory of a person lost to AIDS was installed in the exact location where that memory happened. 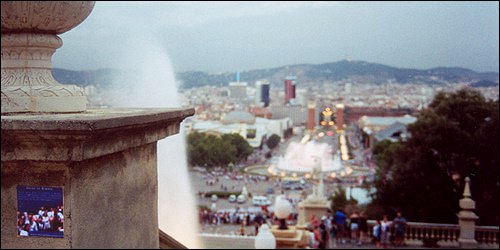 As people woke up and went about their day in Barcelona the next day, the city itself began to share the memories it stored. A bus stop where someone had their first kiss, a bench where someone first told someone they loved them… That was I Thought About You.